Stars: Mark Wahlberg, Kurt Russell, John Malkovich, Kate Hudson, Dylan O’Brien, Ethan Suplee, Gina Rodriguez, Brad Leland, James DuMont, Douglas M Griffin, Jason Kirkpatrick, J D Evermore, Joe Chrest. The towering oil rig inferno? In April 2010 the Deepwater Horizon, a free floating oil rig in the Gulf of Mexico some 40 miles off the coast of Louisiana, exploded. Eleven of the 126 crew were killed and some 50 million barrels of oil spilled into the Gulf, creating the biggest environmental disaster in US history. This dramatisation of the events leading up to the disaster is almost like an old fashioned disaster movie from the 70s, that uses the familiar formula of films like The Towering Inferno or Earthquake as its template. The film has been written by Matthew Michael Carnahan (World War Z, etc) and Matthew Sand (Ninja Assassin, etc), and is based on the meticulously researched article published by the New York Times that drew on insiders accounts of the decisions leading up to the explosion. Many of the actual survivors worked as on set advisors, which further adds to the film’s authenticity. While BP and Haliburton own the Deepwater Horizon rig, they have contracted the work of setting it up to a specialist crew under the leadership of the experienced Jimmy Harrell (Kurt Russell), who is like a father figure to the younger crew. He also has an unblemished safety record over his long career. Another essential member of the crew is Mike Williams (Mark Wahlberg), the electronics expert. Accompanying the men are a couple of BP executives, including the arrogant and supercilious Donald Vindrine (a perfectly oily and smarmy John Malkovich). The rig is way over budget and behind schedule, so Vindrine is present to apply pressure for the crew to cut some corners during their regulation safety tests and get the rig operational. He overrules the cautious warnings of Harrell. As a result methane gas leaks into the pipe and forces its way up, leading to a massive explosion and catastrophic fire. As the fire rages out of control Williams tries to rescue many of his colleagues, including Harrell, who has been badly injured and temporarily blinded when cut by flying shrapnel during the explosion. 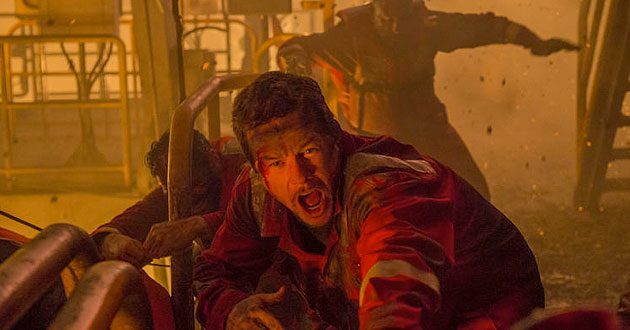 Deepwater Horizon is a story of courage, heroism, survival and sacrifice, but it also looks at the arrogance, hubris and greed of man. The film clearly blames the recklessness of the BP executives for the disaster, while somehow managing to avoid pointing the finger at Haliburton. Early scenes work well to establish the key characters, allowing audiences to identify with them, so that we care about their fates when the oil rig catches fire. An early scene shows Williams at home with his wife Felicia (Kate Hudson) and young daughter, who is reading Williams a report she has prepared for a school assignment on the nature of his work. She sticks a straw into a can of soft drink, and drink gushes out in a fountain, which demonstrates effectively what happens when an oil rig explodes. This gives us a strong sense of foreboding that casts a palpable sense of tension and dread over the film as we are waiting for the inevitable to happen. Director Peter Berg (Friday Night Lights, etc) brings an almost documentary like realism to the material, and he gives us some insights into the demanding life of the oil rig. He serves up lots of technical information to add authenticity to this dangerous nature of life on an oil rig, and he also captures that easygoing, blokey camaraderie that develops between these blue collar workers who often spend up to a month away from home working on an isolated rig under often trying conditions. While some of the technically oriented dialogue may go over the heads of the audience it adds veracity. Berg is also a very visceral muscular director who handles the action sequences effectively, bringing some white knuckle suspense to proceedings. Some of the action sequences are intense and physically exhausting to watch as they serve up a chaotic mix of pyrotechnics, mud, fire and oil. The special effects and pyrotechnics are all superbly handled. Cinematographer Enrique Chediak’s use of hand held cameras takes us into the conflagration and gives the film a gritty sense of chaos and realism. There is also a sensory overload from the soundscape of the raging fire, massive explosions and the collapsing rig. Impressively, Berg and the production crew built a life size replica of the oil rig on an abandoned industrial site in Louisiana that further adds to the authenticity of the material. Russell is a very charismatic screen actor and has a strong and empathetic presence as the gruff Harrell who cares about the rig itself and the safety of his crew. Wahlberg previously worked with Berg on the intense war film Lone Survivor, and again delivers another solid performance. Hudson is wasted in a fairly thankless role as Williams’ wife who helplessly watches the drama unfold on the television coverage. And Malkovich is perfectly cast here as the sleazy executive who shows his true colours when disaster strikes. He is one of the first men to leave the rig in a lifeboat, leaving others to fight the flames and rescue their fellow workers. And Gina Riodriguez (from tv series Jane The Virgin, etc) gives a strong performance as Andrea Fleytas, the sole woman in this male dominated world. Due to relative inexperience though, and her gender, her advice during crucial stages is ignored. Deepwater Horizon doesn’t really go into the aftermath of the disaster and the impact it had on the environment. There is some brief footage of the hearings into what happened, and a footnote about the fate of some of the survivors, many of whom left the oil industry for good. And during the end credits we get photos of the eleven men who died in the accident, which adds a poignant note to proceedings.